For over 30 years, the Tri-Cities Family YMCA has hosted two exceptional run events in the beautiful community of Grand Haven. Our runs feature challenging courses, varied terrain and offer the beautiful scenery of Lake Michigan. All of the proceeds from the race events benefit youth and family programs at the Tri-Cities Family YMCA. Tri-Cities Family YMCA invites you to Kick-off your summer! There is something for everyone from the avid racer to the occasional walker, with our certified 5K Run, the 1 Mile Family Fun Run/Walk (be sure to bring your wagon or stroller) and the Tot Trot obstacle course for ages 3-6. All ages are welcome to participate, so bring your mom, dad, grandma and grandpa. Join us for our annual family event as we promote healthy lifestyles in the Tri-Cities area. 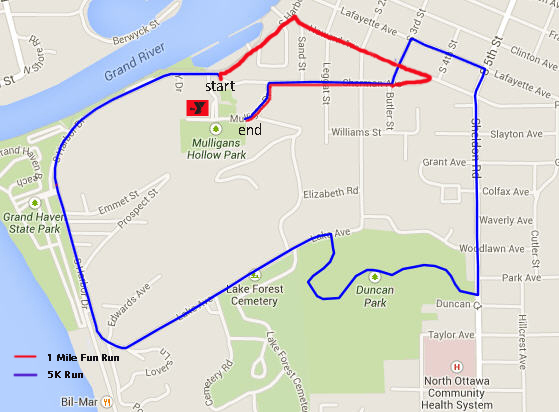 Click to view the course map for the 5K and the 1 Mile.